"Do you remember the 21st night of September?, love was changing the mind of pretenders, while chasing the clouds away....Ba de yaaaa say do remember Ba de yaaaa dancing in September Ba de yaaa never was a cloudy day" --That Earth, Wind, & Fire song has been in my head since the beginning of September, but since it's the 21st it makes more sense to sing it now! I think blue has been my color of the year. I noticed while going through my folder of swatches a huge percentage of them are blues. If you did not know, when I first started blogging I avoided blues. I actually thought blues did not look good me. It's all about finding the right blues! It turned out that blue has become probably my favorite color of nail polish. Times have changed. I was really curious about the American Apparel Sheer polishes when I first heard about them, so when I spotted them I picked up this pretty blue! Redondo Beach is a sky blue jelly. I used 3 coats here, and I'm calling this a jelly. While, it is sheerer when applied with one coat, it's not my idea of a sheer. When I think of sheers I think of those pinky-nudes that take 5 coats to build and are a pain in the acetone to get opaque. This has more coverage than a sheer, and builds up way easier. In Steph's world this a jelly. This was easy to apply and built up so nicely. I love the color. I don't have any complaints. I think this would great to do jelly sandwiches too if you use less coats. haha so those are the lyrics! I always sing, "Do you remember. .. .mumble mumble mumble September? mumble mumble Dancing the night awa-a-a-ay!" So sheer=jelly? Is it streaky at all? looks amazing on you. Haha, glad I was able to help with the lyrics there. Not streaky at all! You're welcome! I love when polishes either by their name or color can remind you of a great memory. There's nothing like beautiful blue!! Ooohhh...I love it! Such a pretty blue. 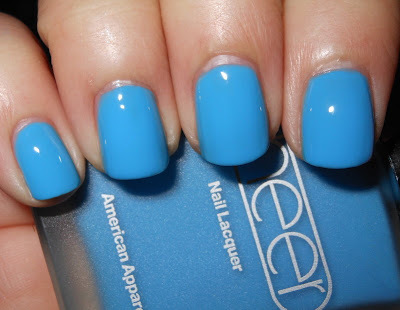 This is such a gorgeous blue and I love it on you! Blue is definitely one of my favorite polish colors! And now that song will be stuck in my head all day. Love it!! But like @google-2336a610483b0340222d2c1a9fb98ba2:disqus I never knew the words either, lol. This is such a beautiful blue jelly! I had no idea American Apparel had a line of sheers (jellies? ), I have to check them out! Love this one - but then I have a built in bias - I was raised in Manhattan Beach - one of those So. Bay beach towns that are sooooo pricy now in the LA area to try to live in but were just my old home town area when I lived there - however I knew it was very cool to live 1.5 blocks up from the perfect beach! What a gorgeous color! I definitely was and probably still am on a blue kick. What a lovely color! I just sang this song with my family during karoke over the weekend! Gorgeous color. Sally Hansen In A Flurry...Dud?